On a crisp autumn morning, I hiked the Murphy Creek Trail with my newly engaged daughter, Julia. 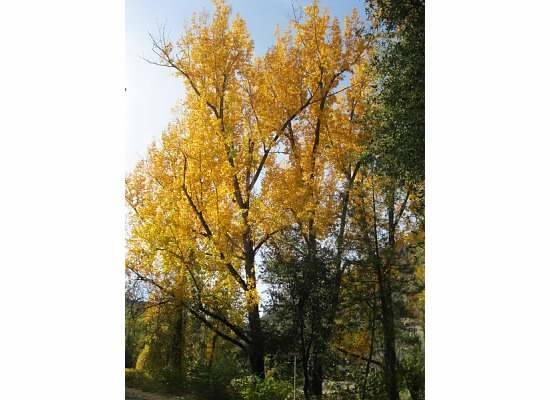 A tree stands adorned in gold on the way to Yosemite. 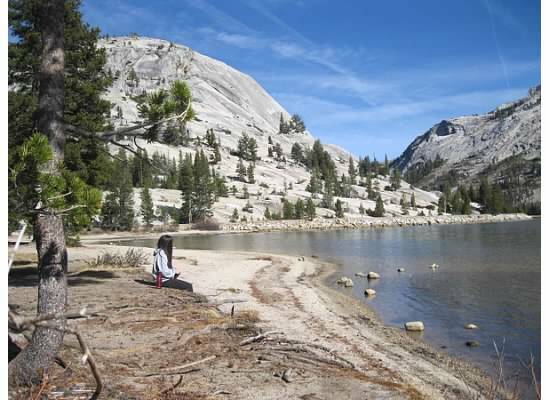 The trail began near Tenaya Lake on Highway 120; elevation 8,150 feet. Murphy Creek empties into the lake. Tenaya Lake with Polly Dome on the left. To start, we walked up the parched creek bed of Murphy Creek bordered by evergreens. 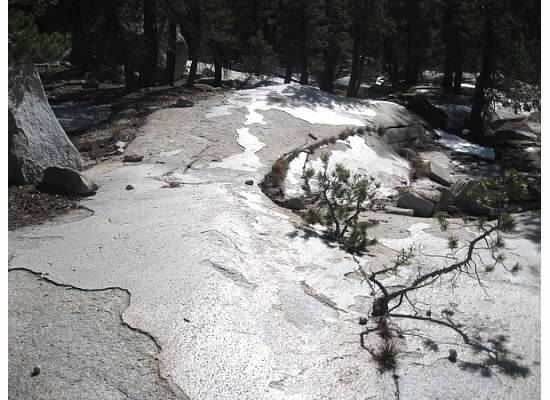 Thin streams of water trickled down the smooth granite shelf. Standing in the middle of Murphy Creek. Where’s all the water? 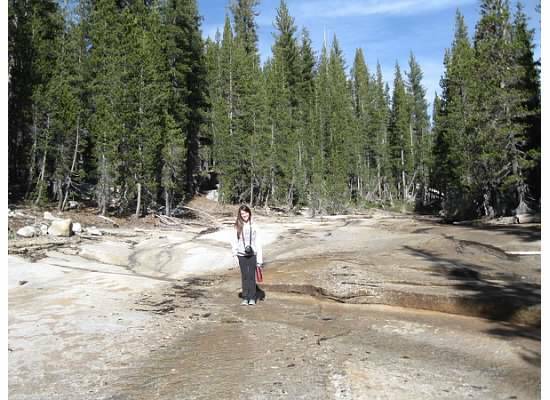 We left the creek bed when it narrowed and entered the lodgepole pine forest that was dotted with glacier erratic. 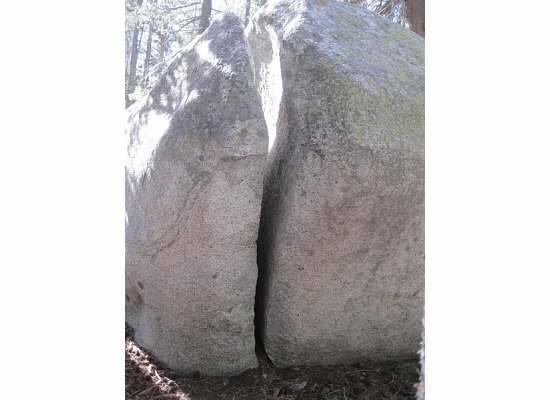 A cracked boulder on the trail. “Sits With Big Rocks” could be her Native American name. 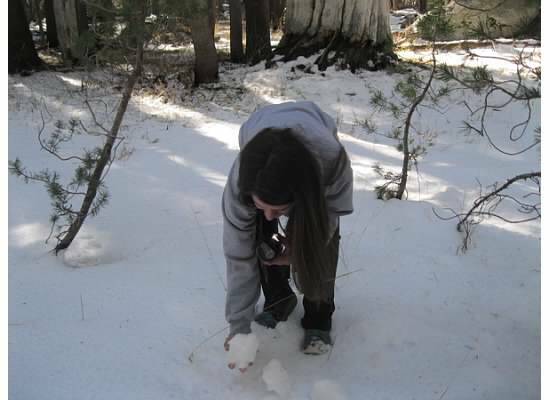 Patches of tiny pine cones and soft pine needles were scattered about. Striped chipmunks scurried around storing food for the winter. 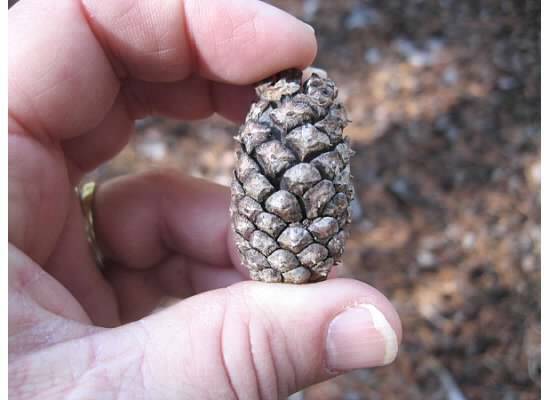 The cone of Pinus Contorta commonly known as lodgepole pine. The footpath climbed gently through the forest and then became covered in snow from a recent but mild-natured storm that closed the road for a short time. The easy climb helped to warm us as we walked in the dappled shade . Powdery soft, good for making snowballs. We followed footprints in the snow of deer and other animals; and crunched over icy puddles of water while discussing wedding plans. 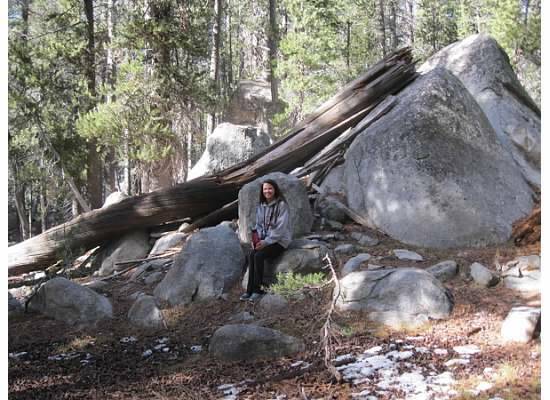 We really had no idea if we were on the trail or not, so we headed over to a stretch of granite slabs and sat in the sun. No one was around, all was quiet and peaceful. The glacier polished granite shined like a gem. 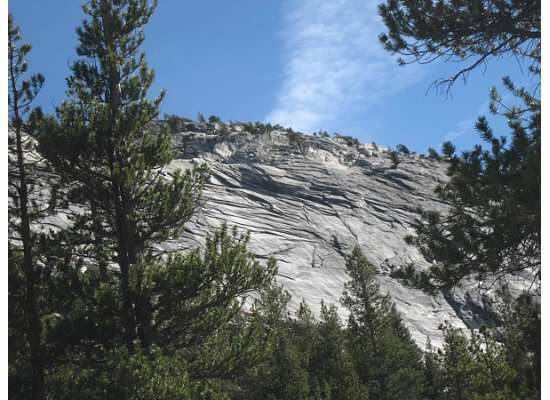 The nearby exfoliating granite wall looked similar to the sloughing granite slabs. Looking up towards Polly Dome. After lots of wedding talk, we retraced our steps in the snow and took silly photos along the way. 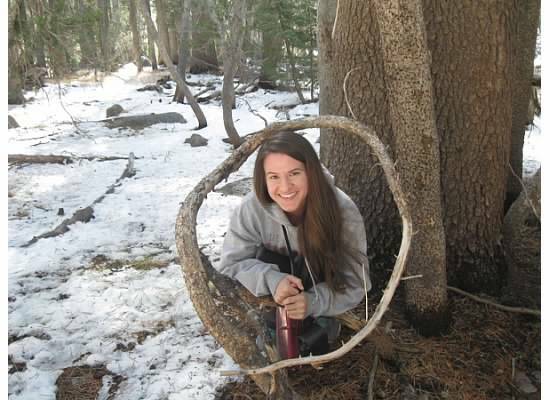 What twisted this tree into the shape of a ring? She was wrong. I wasn’t going to mention that this was probably our last hike before she becomes a Mrs. …until she put that thought into my mind. 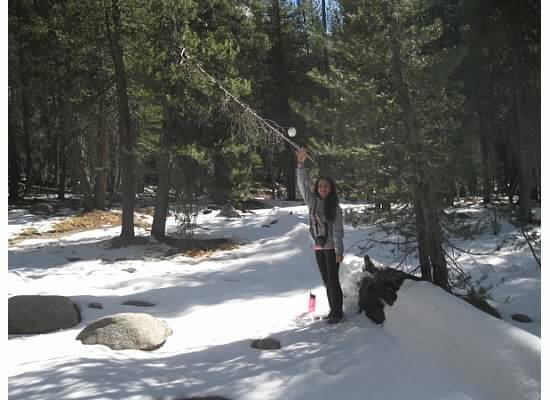 It was an ideal day spent with my daughter in the high country of Yosemite National Park. I look forward to more shared adventures before she marries. 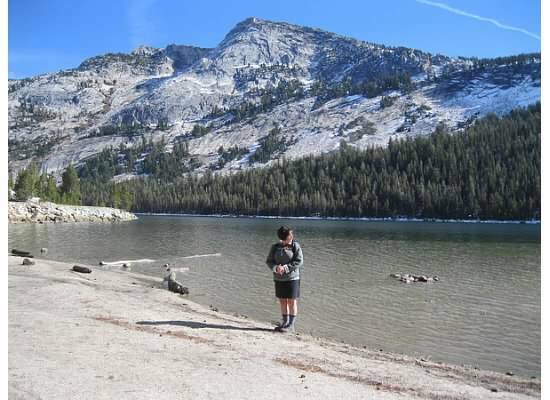 Back at Tenaya Lake after the hike. 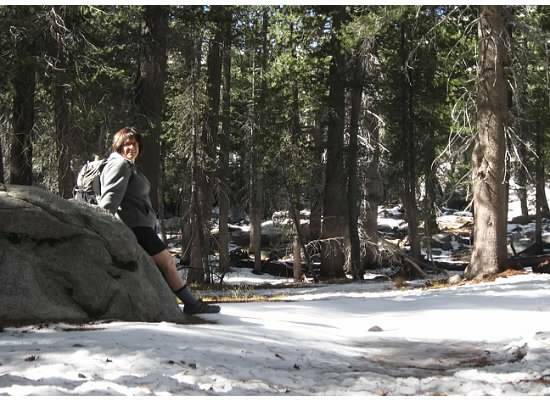 This entry was posted in Yosemite Hikes and tagged Glacier Polished Granite, Hiking, Murphy Creek Trail, Polly Dome, Snow, Tenaya Lake, Yosemite, Yosemite National Park on November 18, 2014 by Janet. Nice to see you back on the trail again. Thanks, Dad. It was nice to be up there again. Congratulations to both you and your daughter! What a nice way to celebrate. I find this sweet, endearing and a memory to last a lifetime. Congratulations to Julia. Such a beautiful spot, snow and fall colors. More importantly, what a very special time for you and your daughter. Those are the times that are cherished. Hope it is a wet winter to help with the drought. Thanks for sharing your special day. Thank you, Terri. I, too, hope it’s a wet winter here. The last part put tears in my eyes, when you said, “She was wrong….” This will be a very special year. Aw, thanks, Carol. The coming year should bring us closer as Mother and daughter.